NEW YORK -- December 4, 2006 -- Laura Bennett, a finalist on the third season of Bravo's Project Runway, has welcomed her sixth child, a boy named Finn, a Bravo spokeswoman confirmed Monday. The baby was born Friday in Manhattan to Bennett and her husband, Peter Shelton, who runs a design firm, Bravo's Bonita Lynch told The Associated Press. He weighed 8 pounds, Lynch said. 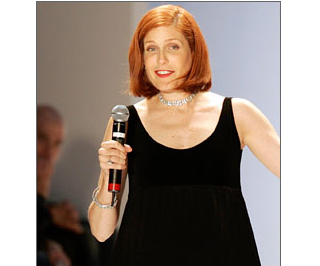 Bennett, 43, known for her glamorous evening wear, discovered she was pregnant while shooting the fashion reality show. She has four sons — Peik, 10; Truman, 7; Pierson, 4; and Larson, 3 with Shelton. She also has an 18-year-old daughter, Cleo, from a previous marriage. Originally posted on December 4, 2006. -- Roy Sokol offers men a chance to be heard and women a rare opportunity to view the struggle with infertility from a male perspective. Infertility and Adoption: A Husband and Father's Perspective brings to life the frustration, anger, humor, heartbreak, and sense of helplessness and a mental philosophy learned in Marine Corps training that helps in overcoming the psychological barriers. While miracles in technology have brought joy to new families, those very advances have placed many couples into a spiraling cycle of hope and heartbreak. One failed attempt may lead to another, but how do you give up when there is always another doctor, another procedure holding the possibility of your dream for a family? Roy Sokol has captured the emotional turmoil he and his wife, Elizabeth, endured as they tried to conceive, the years their lives were put on hold, and the excruciating sense of loss and finally great happiness. He writes too of the couple's journey through the bewildering world of adoption - a path to parenthood fraught with financial, legal, and emotional risks of its own. Start reading Infertility and Adoption on your Kindle in under a minute!